Beauty In The Mirror: What's That Coming Over The Hill??? What's That Coming Over The Hill??? Is it a HexBug?? With Christmas on it's way I thought this would be a great post to share with you about Hexbugs which are these tiny little jittery bugs which my son loves. Wait even if you don't have any children of your own or in your family do you have cats? Yep even our furry felines have taken a liking to HexBugs, if you search YouTube you will find lots of videos showing cats having lots of fun with them. My son was lucky to have the chance to try the limited edition Zombie HexBugs which are perfect for Halloween as well as a couple of the coloured original HexBug nanos. They come housed in these spooky coffins which I think is a great idea, on their backs they have a skeletal clip on layer which glows in the dark. As you can imagine these have been played with on a daily basis since they joined our home. There are different series of Hexbug nanos for you Hexbug fanatics out there, these two below are from the Newton Gravity series. There's another series called Newton Motion and they have a super sweet pink Hexbug which is cool. 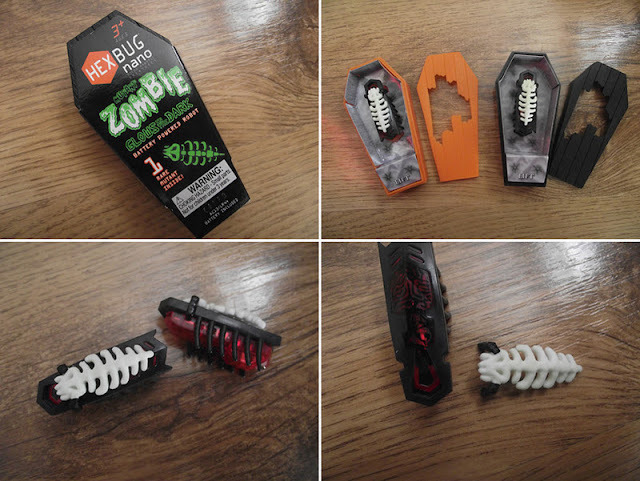 My son bought the Hexbug Glow in the dark track below with his own birthday money, you can buy the original Nano habitat sets in lots of different packs. I think the Habitat set is a great starter set, you get enough track to build lots of different tracks but also you get 2 Nano Hexbugs which is great. The track easily clips together, you can make as many different track sets as you like. So that you can get a true idea of how fast and neat these little bugs are we filmed them for you, also if you don't have any of the Hexbug track then fret not my son also enjoys making tracks out of his Duplo which is great and even Lego! Overall these make great gifts and you can use most objects to create a track, I would recommend the individual Hexbugs as great stocking fillers. They are loved my girls and boys and come in an array of colours. Hexbugs also are available in other bugs such as the spider, inch worm, crab, ant and original so somethin for everyone regardless of age or whether you're a human or animal ha ha! Also Hexbug was recently honored in the UK by the Mum's Choice Awards, you can read the full article here. What do you think about the Hexbugs?